Do you know what kind of stain you need to remove from your carpet? In between professional cleanings, you may have to spot clean your carpet. If you have a spill or spot, you must act quickly to minimize staining. The longer the delay, the greater the possibility that the stain will become permanent. NOTE: If your carpet is a Lees® carpet with the Ultra25® stain protection warranty, it is important to contact 3M at 1-800-352-6789 before you attempt any of the listed stain removal methods. Examine the carpet and cloth for color transfer, color change, or damage to the carpet. If a change occurs, another cleaning solution should be selected. Apply a small amount of the selected cleaning solution to a white cloth and work in gently. Work from the edges of the spill to the center to prevent the spill from spreading. Do not scrub! Blot, absorbing as much as possible, and repeat, if necessary. Do not saturate the area as this may cause the spill to penetrate into the backing. Rinse the affected area thoroughly with cold water after the spill has been removed. Blot with a dry cloth until all of the solution has been removed. Some cleaning solutions will cause rapid soiling if the solution is not completely removed. 1. Blot liquids with a dry, white, absorbent cloth or white (no printing)paper towels. Do not scrub the area! Continue to blot until the area is completely dry. Gently scrape up semi-solids with a rounded spoon and vacuum. Do not add moisture. 3. Pretest any spot removal solution in an inconspicuous area to make certain the solution will not damage the fiber or the dye. After applying several drops to the testing area, hold a white cloth on the wet area for 10 seconds. 4. Examine the carpet and cloth for color transfer, color change, or damage to the carpet. If a change occurs, another cleaning solution should be selected. 5. Apply a small amount of the selected cleaning solution to a white cloth and work in gently. Work from the edges of the spill to the center to prevent the spill from spreading. Do not scrub! Blot, absorbing as much as possible, and repeat, if necessary. Do not saturate the area as this may cause the spill to penetrate into the backing. 6. Continue using the first cleaning solution as long as there is a transfer of the spill to the cloth. It is not necessary to use all of the cleaning solutions if the first solution removes the spill. 7. Rinse the affected area thoroughly with cold water after the spill has been removed. Blot with a dry cloth until all of the solution has been removed. Some cleaning solutions will cause rapid soiling if the solution is not completely removed. We recommend the following solutions for removal of spots and stains. If you have these on hand, you will be able to handle most common spills. Always use solutions in the concentrations recommended. See the chart below to find the best solution for your stain. For assistance in choosing the correct solution, call Dalene Flooring and ask which is best for your particular type of carpet. Mix 1/4 teaspoon of a clear, non-bleach, non-lanolin, non-optical brightening dishwashing liquid per one cup of warm water. Allow the detergent to remain on the stain for eight to 10 minutes. It may be necessary to rinse with warm water several times to completely remove residues. Never use an automatic dishwashing detergent because many contain bleaching agents that may destroy the carpet color and damage fibers. Never use a laundry detergent of any type, because laundry detergents may contain optical brighteners (fluorescent dyes) that dye the fiber. 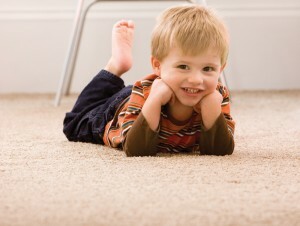 Use powdered carpet cleaners such as CAPTURE®. Capture dry powder cleaner is available In-Store purchase. Use caution when using a dry cleaning fluid. A non-flammable spot removal solution is preferred. Transfer solution to the spot with a damp towel–do not apply directly to the spot since direct contact may destroy the backing. *** For an extensive list please reference the CRI website at www.carpet-rug.org.